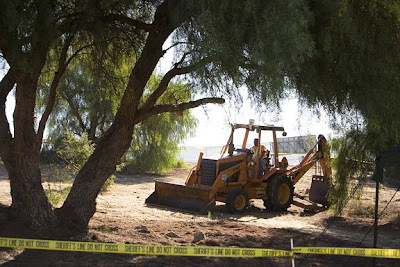 An excavation began today in Moorpark near the Ventura County/LA County for 16 year-old Roger Dale Madison was possibly killed and buried by serial murderer Mack Ray Edwards. 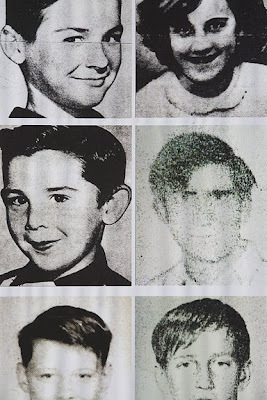 Edwards preyed on children and has been linked to at least 18 murders in the 195os and '60s. While on San Quinten's deathrow, Edwards hung himself with a TV cord , but also confessed to the kidnapping and killing of Roger Dale Madison. The dig is next to the 23 freeway and will take about ten days to complete. Edwards was a construction foreman for a California freeway road building company back in the '60s and buried his victims under the new freeways. Edwards turned himself in to the LAPD, due a bad conscience back in 1969. New evidence from author Weston DeWalt, who was investigating another child disappearance back in 1957, and interest from LAPD Lead Detective Vivian Flores, the search was renewed. 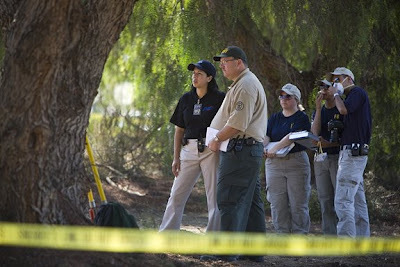 With ground penetrating radar, a particle detector that sniffs out human bones, and cadaver dogs officials found an area of great interest to begin the dig. Over 44 FBI agents and dozens of police officials are involved in the dig. 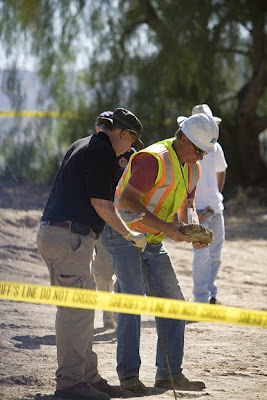 Here is a slideshow of my photos from the dig in the LA Weekly.